I recently played through Uncharted: Drake’s Fortune, and what the critics say is true: it is a very well constructed game, and the animations, characters and voice actors are superb. It did, however, leave me with an unsettled feeling in the pit of my stomach. After all, here was charming, likeable Nathan Drake and his lovely companion Elena, who moved and spoke like real, friendly people I might want to hang out with, looked more realistic than most other video game characters, and killed countless human beings without hesitation or remorse. This problem runs rampant in video games: because of the genre of a game or the standards set by games that came before, all the hard work put into characterization is thrown out the window in favor of overused tropes. Uncharted: Drake’s Fortune attempts to bring an experience to the console that is as close as possible to a high quality action/adventure film, but even in Indiana Jones’s wildest adventures, he never killed as many thugs as Nathan Drake does within the first few hours of Uncharted. This works against all the hard work put into the character of Nathan. It’s hard to believe that a man who kills so easily is also charming and likeable. But this is an action/adventure game, and action/adventure games generally pit the player against a lot of enemies. When the mass slaughtering is done by a character like Kratos or Marcus Fenix, it seems more natural because these men are ridiculous stereotypes of action heroes. They are grim, unpleasant, murderous clichés. With a realistic character in the forefront, however, this behavior strikes a more discordant note. There are simple changes which could have made this disconnect less jarring. One solution would have been to cut down on the number of enemies Nathan Drake faced on his adventure. The game repeatedly recycles combat arenas by sending second and third waves of enemies into the room after each group is dispatched. This made many of the action sequences longer than necessary and increased the body count considerably. Even if every man he killed was actively trying to kill Nathan (and they were), you'd think that when a person loses count of the human beings they’ve killed it might affect their sunny disposition. Another approach might have been to simply slow down the pace of the confrontations. Enemies do not hide behind barriers for very long, always pushing forward to flank Nathan and his companions. They do not hesitate, retreat, regroup or try to find aid. A group of enemies enters an area, takes cover, moves in to attack, and dies. If they behaved more like they valued their own lives, it could have extended the gameplay and added tension. Maybe they could have even, just every once in a while, presented a character who realized that twelve of his well-armed friends had just been killed and that he was all alone facing their killer. That would be an appropriate time to drop one’s weapon and run like hell, or even surrender, allowing the player an opportunity to show that he is playing a pretty good guy who doesn’t kill unless he has to do so. I understand that this would make the game a less action-packed affair, and that this would be a concern for the developers. 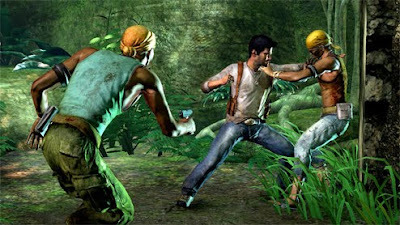 Many consumers look for constant, frenetic action in their games, and Uncharted delivers in that regard. But as games present more realistic, believable characters, questions are raised about whether the gameplay itself detracts from their believability. And when Elena goes from nervously joking about having never fired a gun before to calmly launching explosive rockets at strangers from the back of a jet ski, I must admit that I am a little less in love with the otherwise charming and intelligent leading lady. In the finale of BioShock, the manipulative villain of the game transforms himself into a superhuman monster, despite the fact that it hardly fits the character or the story at all. Why would an enterprising businessman and criminal attempt a direct confrontation? An otherwise excellent, complex and genre-defying shooter, BioShock fell prey to the idea that every video game needs an epic final boss to fight. The result was one of the few flat and uninspired moments in an otherwise stellar game. Similarly, in Batman: Arkham Asylum, the Joker, who has made a career out of using people like pawns to accomplish his mad schemes, goes out of character and transforms himself into a huge, preposterous mutant to fight Batman directly. Other than in that moment, Arkham Asylum does an excellent job of conveying the Joker as a character, and the translation from comic book to video game was impressive. But the developers wanted a big set piece and an imposing enemy for the finale, so all that careful character development was thrown out the window. Developers need to realize that it is okay to be different for the sake of a character. A huge, tough boss is all well and good in the right game, but when Batman thwarts the Joker’s plans and defeats his thugs in the comic books, the only thing left to do is to sock him in the jaw and throw him in a cell. For the narrative of a game to improve, the mechanics and gameplay can’t work against the development of the plot and characters. I’d much rather have a great story from beginning to end than have a boss fight just like those in every other game. And if there were a little less killing in Uncharted, I might feel like having a beer with Nathan Drake if I ever met him in a bar. As it stands, though, I think my best bet would be to run for my life. Haven't played Uncharted (played the multiplayer beta, though), but I still sympathize - Arkham Asylum was much the same thing, though I wasn't very critical of it at the time because I was looking for something purely entertaining. Michael Thomsen pointed out that Batman's core strength as a good hero is his inner battle between his position as a brutal detective who must beat down waves of goons and his checkered past of knowing what that kind of violence can do to a person, but, for the most part, that element was left out of the game in favor of something much more fun. After reading your piece, I had to think for a while, trying to understand why I found it acceptable for Nathan Drake to murder so many without any emotional strain. The comparison to Indiana Jones is fair, the game was clearly inspired by it, but let us not forget that Indiana Jones' very own murder count is well in to double figures. (Shooting that unarmed sword-man in particular clearly springs to mind). The point being is that when Indiana Jones kills, it's rarely thought about by the viewer. Even more unnerving in hindsight is that it is sometimes done for light hearted effect (let's play spot the Wilheim scream). I think that the reason it is so dismissible in a film like Indiana Jones isn't because of the charming characters, or the light-hearted atmosphere that surrounds the situations. I think ultimately, the film serves the viewer a tale about an adventurer, one which goes to exotic locations performing dangerous feats. This is what the viewer wants, and in a sense it is expected. Uncharted is a game about an adventurer. The kind of adventurer we've been reading in books and watching in movies for decades. The kind that would go to fantastical places, seek the treasure, grab the girl and fight the baddies (and occasionally even kill them, but shhh lets not think about that, we're on an adventure). Your views do provide a valid point, the characterisation conflicts with their actions, and the death count is probably too excessive. I wish for the day where pacifist games were at the forefront of the industry, or mainly that the violence in video games matured. However, I think Uncharted provides a great adventure for us to experience like no other artistic medium can. The charming characterisation ultimately just allows us to find it easier to relate to them. The industry often takes too many misguided cues from films, it's a rarity when a game manages to incorporate cinematic ideas so eloquently to it's core structure for the game's benefit.